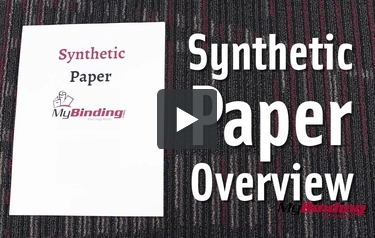 Made from polyester film, Xerox Synthetic Digital Paper is nearly indestructible. Two-sided, matte coated with a smooth finish, Xerox Synthetic Paper replaces the need to laminate your documents used for posting outside or in extreme conditions. Resistant to water, oil, grease, tearing, weather and wrinkling, Xerox Synthetic paper is ideal for outdoor notices or signs, catalog pages, cookbooks, manuals, maps, construction plans, luggage tags, menus and much more. Suitable for use in all electro photographic dry toner applications, Xerox Synthetic Digital Paper can be used in digital presses, color copiers, and laser printers. Xerox Synthetic paper is a heat stable, white color, high grade polyester paper coated to accept toner applications, however cannot be used with ink jet printers. Replace your document laminating workflow today with economical and resilient Xerox Synthetic Digital paper. Welcome to MyBinding video. 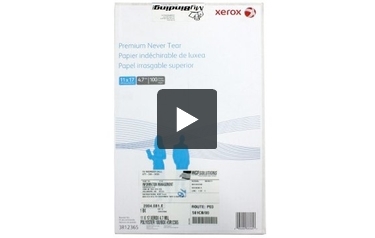 This is a look at the revolutionary Xerox Polyester Paper, a durable paper solution. There are some documents you simply cannot risk ruining. Xerox has designed polyester paper in different sizes and thicknesses and applications so that you can have documents that are preserved without fear. Papers range from completely opaque to very transparent and when it comes to handwriting, they perform just like regular paper. There's no fear of smudging or smearing. Papers are also printable with laser printers, color as well as black and white, with stunning results. So fill-in-the-blank forms and other affidavits are no problem. The durability of these polyester papers is simply remarkable. They can withstand the most rigorous of tests. When it comes to spills, a simply wipe up with a damp cloth or a dry cloth and you're set to go. Even though they cannot be torn, they can be punched, perforated, and bound in any fashion that you need. And that's Xerox Polyester Paper. For more demos, reviews, and how-tos, and ideas, check out MyBinding.com.